Do you also use some of the products they have? 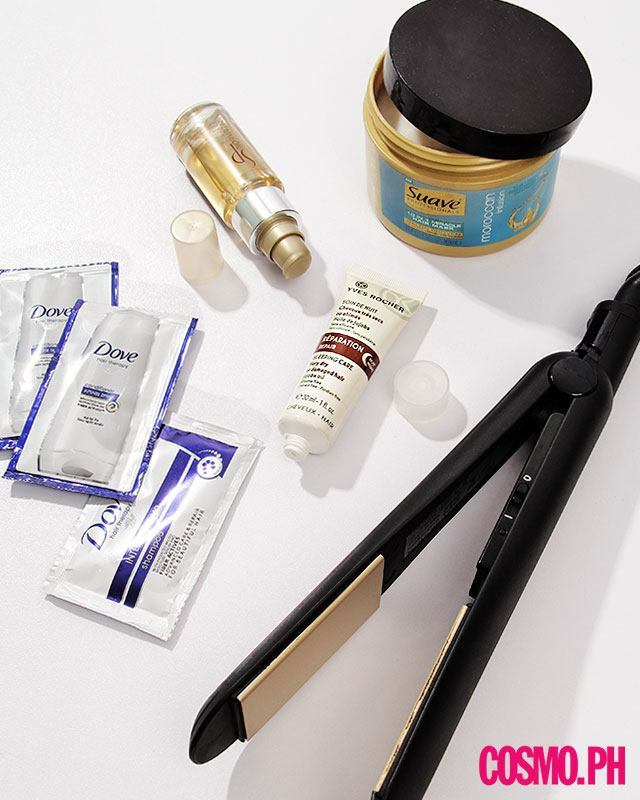 Have you ever been curious about how other people take care of their tresses? We asked 10 girls to share their haircare routines, and tbh, we were surprised at how different each one was! 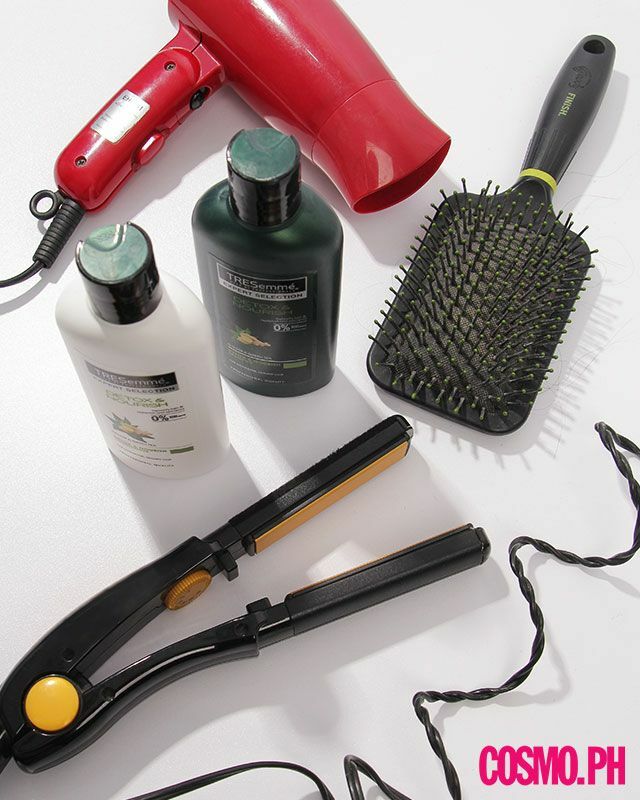 Check out all the products and tools they use below! Routine: I shampoo every day, condition my locks every other day, and use a hair mask once a week. I know I'm not supposed to shampoo that often, but my hair gets too oily when I skip a day. After I shower, I air dry—no comb/brush. But one thing I never forget to do is apply hair serum after washing my hair. Salon: Every six months, I get a P250 haircut when it gets too hot for long hair. Routine: I wash my hair daily and usually just let it air dry. When I feel like it, I use a blow-dryer and sometimes a straightener. Salon: I only go to the salon when I need to get a haircut. I've only tried a hot oil treatment once, and I've never dyed/colored my hair. Routine: I'm a wash-and-rinse kinda girl. I shampoo every other day (sometimes every two days), and usually let my hair air dry (especially after getting a perm). But even when my hair was straight I rarely used heating tools. I tend to wear my hair down, but I never go anywhere without a hair tie! Salon: Every six months for a trim and treatment. Routine: I shampoo daily because my hair easily gets oily, and I condition my tips thrice a week. I don't use any heating tools. I apply a bit of mousse while my hair is damp if I feel like sporting more defined waves; if not, I just let it dry on its own. If my head smells like usok by the time I get to work, I have a canister of dry shampoo on my desk to freshen my tresses up. Salon: Depends on when I feel like it. I like experimenting with my hair! Routine: My locks are basically dead so I use every freaking hydrating product available to resurrect or at least make my strands appear less straw-like. That said, I rarely heat-style my tresses. Besides, I like natural hair bends—I think they make me look cool, LOL! I wash and condition my tresses every other day to prevent the color from fading. Then I spritz dry shampoo (I switch up the brands every two weeks) on no-wash days. It absorbs the oil on the scalp and gets rid of odor. 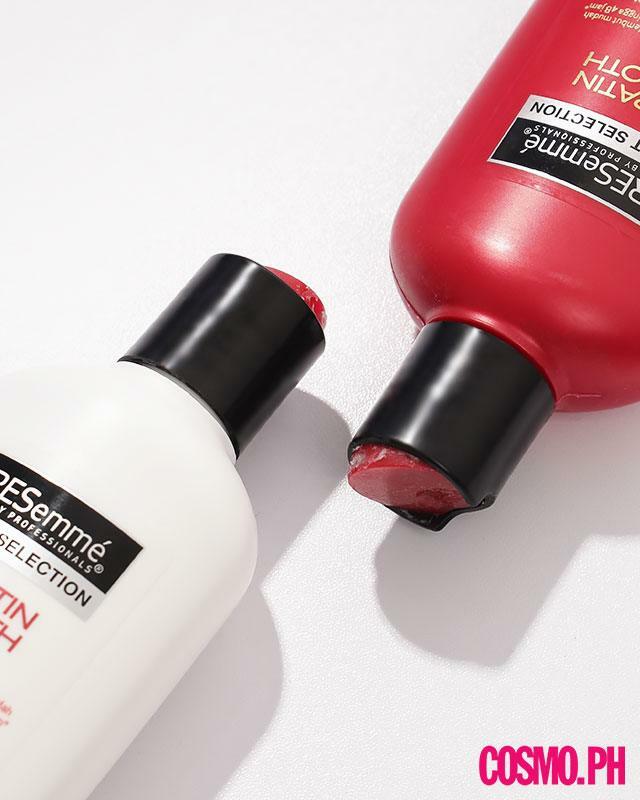 I keep the ends soft with a lightweight hair oil from Davines—I just love its powdery scent. It's been my go-to for three years. I use a mask every weekend as a softening and rejuvenating treatment. I go for a ponytail when I'm too lazy to brush my locks. 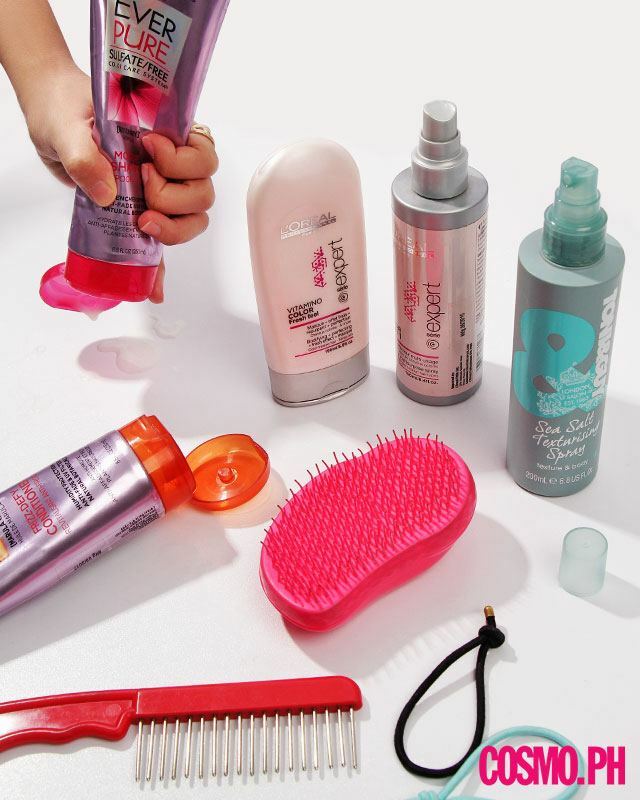 I rarely use my Tangle Teezer, tbh—again cool-girl hair bends. The hairband is a new addition. I was influenced by the girls I saw on IG, haha! Salon: I get my roots and my color retouched every three months because mahal magpaganda! Routine: Since my hair literally has a life of its own and gets dry easily, I tame it down by only washing it every two to three days. I've also switched from a generic conditioner to using a hair mask twice a week because I recently noticed that my hair has become drier than usual. During my in-between days of no washing, I use a hair gloss to make it look ~fresh~. I think my hair looks best the day AFTER I wash it. Salon: I try to go get a trim and root touch-up every three months. I haven't done any treatments in years. 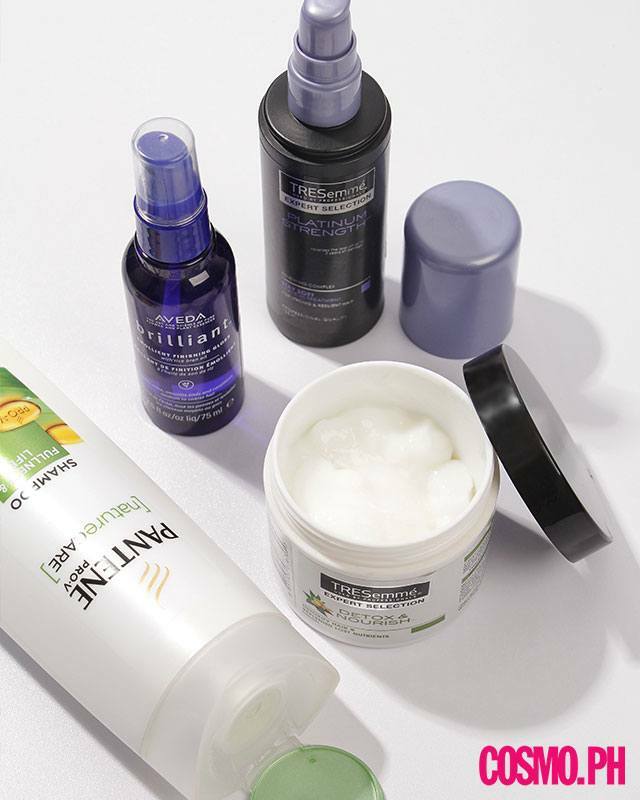 Routine: My hair is rebonded, so I use products that are extra hydrating to avoid that crunchy and dry texture. My daily routine consists of washing my hair with shampoo (Yes, every day! ), applying a ton of conditioner, and rubbing a drop of hair serum from the middle to the ends of my hair to give it ~*shine*~. Once or twice a week, I use a hair mask before I condition my locks. After washing, I let my hair air dry. But sometimes, if I really have to, I will blow dry it on the "cool" setting. And once it's dry, I use my flat iron to flip the ends of my tresses in—my mane looks more natural this way. I apply leave-in conditioner after to make it extra soft! Salon: For straightening, every six months. For cuts and treatments, every two to three months, depending on how dry my ends are. Routine: I only shampoo every other day and condition about five days a week. There are one to two days when I don't wet my hair at all. I use the hair mask once every three to four weeks (aka when I remember to) but I don’t mind going without it. I usually just comb my hair while it's wet and the Tangle Teezer is what I leave in my purse for the rest of the day. 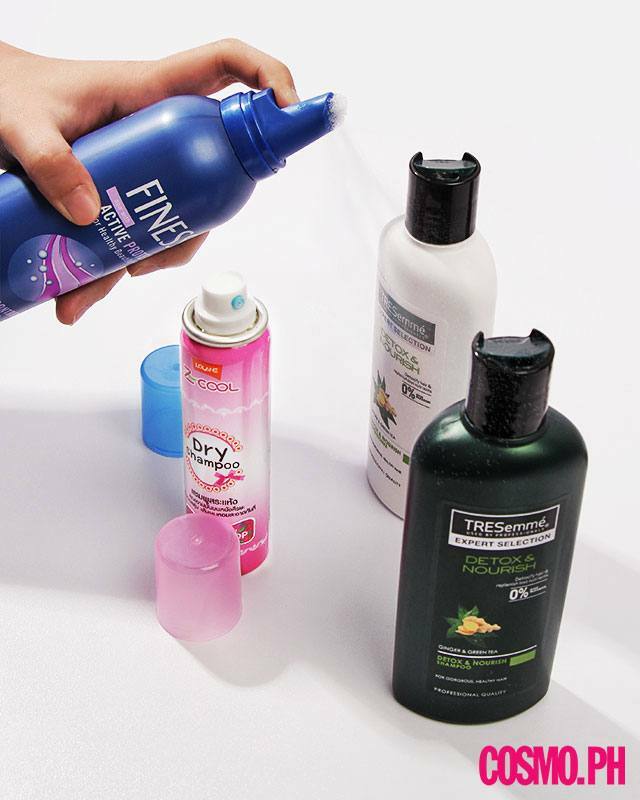 From time to time, I use the 10-in-1 spray when I know I'll be busy and on-the-go, or whenever I'm under the sun. For nights out, I use the texturizing spray to add volume. Salon: I go every three to five months for a trim and/or color. 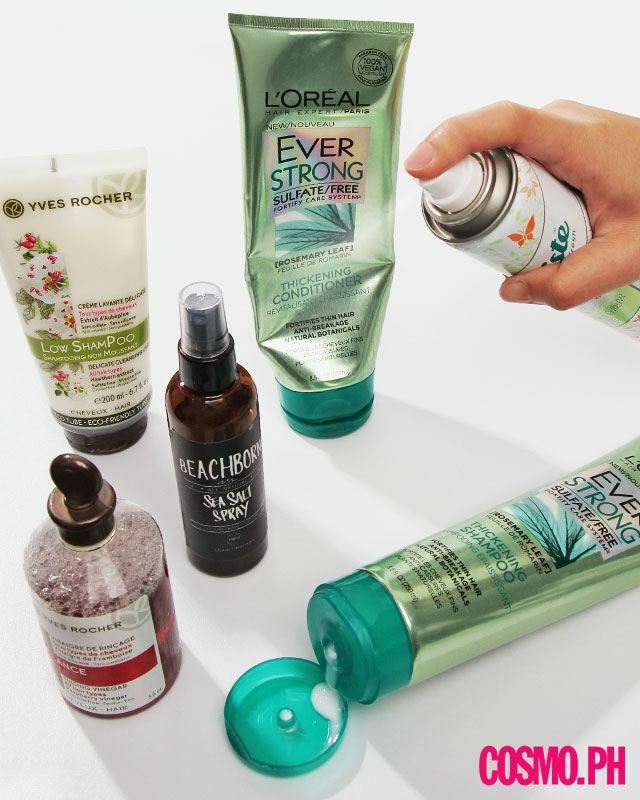 Products: L'Oreal Ever Strong Sulfate-Free Thickening Shampoo and L'Oreal Ever Strong Sulfate-Free Thickening Conditioner, Beach Born Beach Spray, Batiste Dry Shampoo in Clean & Light Bare, Yves Rocher Rinsing Vinegar, Yves Rocher Low Shampoo. 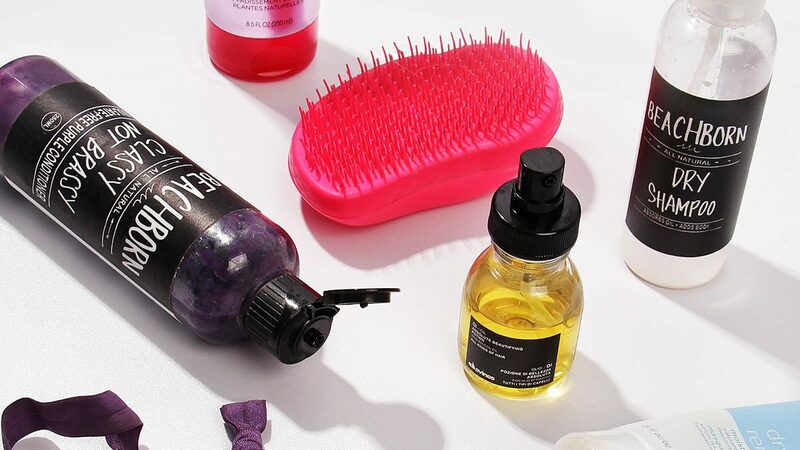 Routine: In place of a clarifying shampoo—which is bad for colored hair—I use a rinsing vinegar to cleanse my scalp once a week. I follow this up with the Low Shampoo, which has no sulfates and silicones. I try to wash my hair every other day, but sometimes, I'm forced to wash it every day if my roots get too oily. On non-hair wash days, I use the Batiste Dry Shampoo in Clean & Light Bare. It's also useful when traveling to cold places. When I feel like bringing out my curls, I use the Beach Born Beach spray—it makes my hair look SO good! I use hair clamps more than hair ties because I feel like they're gentler on my locks. I went through horrible hair fall phase because of PCOS, so I really worked hard to nurse my tresses back to health. I also use a wide tooth comb to untangle it in the morning. Salon: I go twice or thrice a year just to keep my waves looking great. Routine: I have naturally wavy-curly tresses, so my ultimate goal daily is to tame frizz without compromising my hair's natural texture. After showering, I apply Kerastase Thermique, blow dry with a cylinder brush, iron the bangs and top part of my hair, apply spray wax to texturize, and iron again to touch up the bangs. 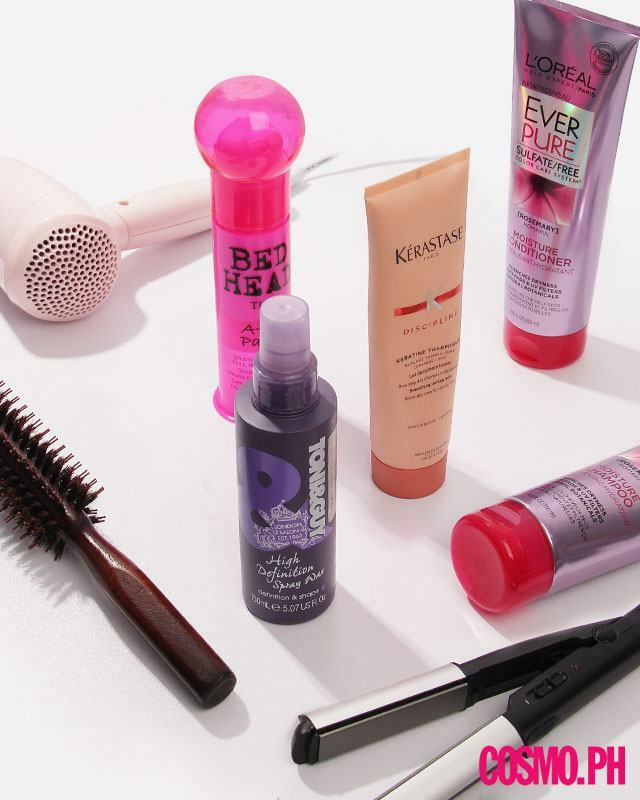 Midday when my hair needs a pick-me-up, I apply Bedhead’s After Party to smooth it out. It takes me 15-20 minutes in the morning to finish my hair care routine. To those thinking a pixie cut is low-maintenance, think again! I wouldn't have it any other way, though! Salon: Trim every two to three weeks (I am super strict about this); treatment and color every two months.